CBDT has issued circular no. 16/2017 dated 25 April 2017 about Lease rent from letting out buildings/developed space along with other amenities in an Industrial Park/SE-- to be treated as business income. The issue whether income arising from letting out of premises /developed space along with other amenities in an Industrial Park/SEZ is to be charged under head 'Profits and Gains of Business' or under the head 'Income from House Property' has been subject matter of litigation in recent years. Assessees claim the letting out as business activity, the income arising from which to be charged to tax under the head 'Profits and Gains of Business', whereas the Assessing Officers hold it to be chargeable under the head 'Income from House Property'. 2. The matter has been considered by the Board. 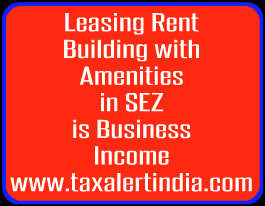 Income from the Industrial Parks/ SEZ established under various schemes framed and notified under section 801A(4)(iii) of the Income-tax Act, 1961 (`Ace) is liable to be treated as income from business provided the conditions prescribed under the schemes are met. In the case of Velankani Information Systems Pvt Ltd, the Hon'ble Karnataka High Court observed that any other interpretation would defeat the object of section 80IA of the Act and government schemes for development of Industrial Parks in the country. SLPs filed in this case by the Department have been dismissed by the Hon'ble Supreme Court. In a subsequent judgment dated 30.04.2014 in ITA No 76 & 78/2012 in the case of UT vs. Information Technology Park Ltd.2, the Karnataka High Court has reaffirmed its earlier views. It has held that, since the assessee-company was engaged in the business of developing, operating and maintaining an Industrial Park and providing infrastructure facilities to different companies as its business, the lease rent received by the assessee from letting out buildings along with other amenities in a software technology park would be chargeable to tax under the head "Income from Business" and not under the head "Income from House Property". The judgement has been accepted by the Board. 3. In view of the above, it is now a settled position that in the case of an undertaking which develops, develops and operates or maintains and operates an industrial park/SEZ notified in accordance with the scheme framed and notified by the Government, the income from letting out of premises/ developed space along with other facilities in an industrial park/SEZ is to be charged to tax under the head Profits and Gains of Business'. 4. Accordingly, henceforth, appeals may not be filed by the Department on the above settled issue and those already filed may be withdrawn/ not pressed upon.